A meddling horse, paper bag floors and a flying saucer on the town square. 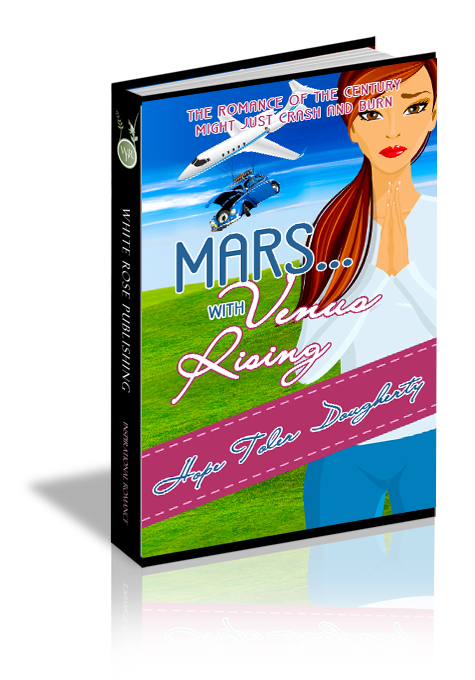 The little town of Mars has it all--including a brand new resident who might spell heartache for one of its own. When John Townsend—full of life and the joy of living—moves to town, he rattles Penn's view of herself, her life, and her dreams...which isn't such a bad thing until she falls for him and discovers he's a pilot. Penn Davenport wiggled the carrot in front of the escape artist horse and squeezed the halter she’d hidden behind her back. The gray roan stretched his long neck toward the orange prize and sniffed. As tame as an old lap dog, Peri had a mind of his own. When he decided to visit the neighboring houses, he worried the lock on his corral gate until it popped and he trotted into freedom. Fortunately, most of her neighbors on Oakland Street loved Peri, welcomed his visits and his nosey poking under their shelters or garages. Unfortunately, they encouraged his visits with sugar cubes and hugs. If he didn’t want to return home yet, she’d never be able to slide the halter over his head. She glanced at her watch. Twelve minutes until the planning meeting for the Mars Area Apple Fest began. If this crazy horse cooperated, she might have a chance to settle into a chair before the minutes were read. “Here we go, darling. Take a bite of this delicious carrot. Come on. I know you want it.” Please, God, help me slip this halter on and get Peri back home. You know how I hate walking in late to meetings. Peri backed up a step, and Penn’s hope for an easy capture melted like chocolate on the floor board of a locked up car in mid-July. She gritted her teeth. Instead of retreating farther away from her, however, the horse shook its head and stepped toward her again. His lips reached for the carrot and grabbed the orange tip. Success. Peri opened his mouth, nibbled, and then crunched half the carrot with his teeth. Penn slipped the halter over his head and captured her sociable, lovable, independent horse. She closed her eyes and nuzzled his warm neck, breathing in his musky smell. A familiar peace settled over her. Scenes from her childhood when she sought solace from this sweet creature flooded her mind. Thank you, God. For today and for all those other times, too. She straightened and glided her hand down his velvety nose. “Here we go, silly boy. Time to get home.” She tied the lead line to the bumper of her vintage Volkswagen and crept back to her house with Peri clomping behind her. Careening into the Town Hall parking lot, Penn shifted down to second gear and slid to a stop beside a shiny, black motorcycle. Who in the world drove that thing? Nobody on the Apple Fest committee, for sure, but the Town Hall closed for business at five o’clock. She gathered her Apple Fest folders from the passenger seat, slung her purse over her shoulder, and nudged the car door closed with her hip. Hugging the files to her chest, she raced up the sidewalk, grabbed the door handle, and stopped. She drew in a calming breath and said a quick prayer to find a seat without calling attention to her lateness. As she pulled on the handle, a bell sounded, usually announcing Town Hall customers. Today, it announced her as a late-comer to the meeting. Great. So much for arriving unnoticed. Another unanswered prayer. Every head turned toward her as she entered the conference room and spied an empty swivel chair. Having spent her entire life in Mars, she knew all the eyes staring at her. All of them, except two black-as-night ones fringed with long, black eyelashes. Black eyes, black hair, black t-shirt. Safe bet he was the owner of the black motorcycle. Safe bet he was wearing black jeans and black shoes—or wait. Black boots, too. How original. She slunk into the open seat. Whoa. Where did this foul mood come from? From chasing that crazy horse and walking in here late, that’s where. She laid the files on the table, willing those eyes to let her settle in peace. Be positive. Try for a better attitude. Be glad that someone new is willing to participate. “Sorry I’m late.” She mumbled her lame apology to no one in particular. What is a guy dressed like that doing on a committee meeting for an apple festival anyway? Who strong-armed him into joining this group of retirees and stay-at-home moms? Three years ago when she’d graduated from Duquesne University with a brand new accounting degree, her aunts had cajoled, wheedled, pleaded, and produced shimmering teardrops until she’d capitulated and signed on as the festival’s treasurer. She knew something about being strong-armed...or maybe guilted into serving described her situation better. She loved her aunts so much, she’d agreed, and would have without all the drama, even though the thought of planning Apple Fest made her eyelids droop. “Yoo-hoo? Penny?” Clara Hough rapped her knuckles on the rectangular conference table. Penn pulled herself back to the meeting and the interested stares from the committee members. She focused on the celery-colored wall behind Clara’s head, and for the second time in thirty minutes she ground her molars. “It’s Penn.” She twisted the lapis ring on the third finger of her right hand. Jacob Doran, a Korean War veteran slid his blue pen toward the stack of folders. She smiled at him, shook her head, and slid it back to his notepad. After dropping the Y from her name during her senior year of high school, she was Penn, not Penny. Most people abided by the change, but her aunts slipped up occasionally. She didn’t mind her aunts calling her by that nickname, but she suspected that Clara used “Penny” today just to irritate her. Once more, the pen rolled over to her place. Before she pushed it back, she caught sight of a twitch on Mr. Dressed-in-black’s mouth. His eyes flickered away from her, but he was laughing. At her. Her humiliation was complete. Chastised for being late, called by her childhood name, not once but twice, and laughed at and dismissed by the new guy. She’d been dismissed by cute guys ever since high school. Ten years ago, she’d nurse her hurt by riding Peri or retreating into books. Instead of wallowing in her discomfort today, she straightened her spine and leaned over the cherry veneer table with her hand extended toward Mr. All-black. “I’m Penn Davenport.” She willed him to look at her. He shifted his gaze to her and waited a couple of beats before grabbing her hand. One corner of his mouth tipped up. “John Townsend. Pleased to meet you.” He inclined his head, released his hold, and turned his attention back to Clara. Question 1: Periwinkle, Penn's horse, is a source of solace and comfort for her. Have you ever experienced solace or comfort from a pet? Describe that time. Question 2: Penn enjoys wearing and derives comfort from her mother's lapis ring. Do you have an heirloom, perhaps a piece of jewelry, that reminds you of a loved one and brings you comfort or happiness? If so, describe the object and the loved one. Question 3: Jancie and Winnie sacrificed for Penn by uprooting their lives and moving from North Carolina to Pennsylvania to rear Penn. Share about a time when you've sacrificed for a loved one. Question 4: Describe Penn's personality, her strengths and weaknesses. Describe John's personality. Answer 4: She's cautious and a realist. She is a perfectionist who doesn't want to fail. She loves her aunts and wants them to be happy. John is a free-spirit who sees failing as a stepping stone to success. Question 5: John buys a fixer-upper with relatively no refurbishing experience. Have you ever jumped into a major project such as renovating a house with little or no experience? What were the results? Question 6: Describe how family is an important factor in this novel. Answer 6: Jancie and Winnie sacrificed their retirement years to rear Penn. Penn's love for her aunts propelled her to do the thing she feared most, flying. By not coddling him, John's mother taught him to be strong and not to fear failure. Question 7: Although Penn doesn’t like the labels she's lived under since childhood (being an orphan is one example), she seems to cling to them anyway. What kind of labels are you clinging to? Question 8: Penn was a Christian from the beginning of the story, but she didn’t view God as her strength or as an ever-present help in trouble until the flight to her aunt. Is God your strength and your help every day? If so, please describe a specific time when God has been your strength. Question 9: Penn discovered God’s faithfulness in a real way during the flight and pushed through her fear of flying with His help. Has God ever sustained you through a fearful time? If so, describe that time. Question 10: Penn recited several Bible verses to help her endure the flying ordeal—the Twenty-third Psalm, Psalm 56:3, Matthew 28:20 and Joshua 1:6. Which Bible verses do you use to conquer fear? What kind of fear is holding you back from the life God has waiting for you?